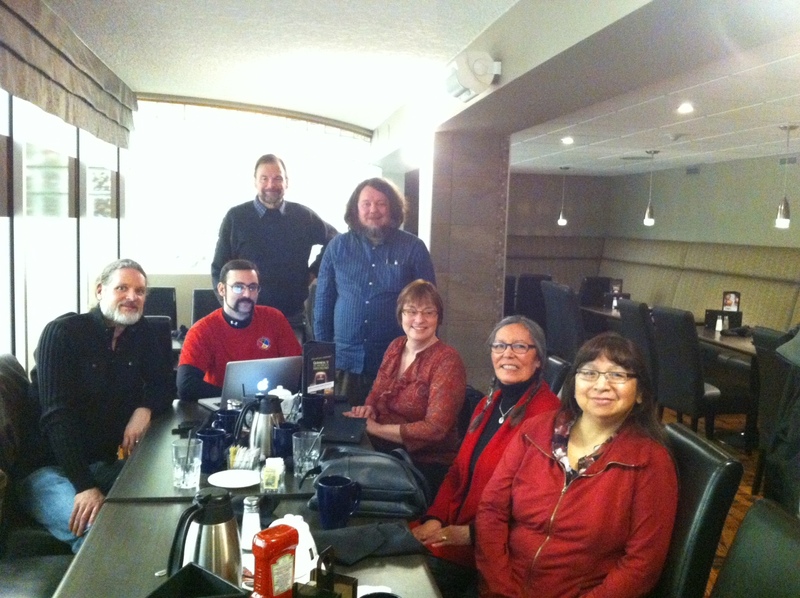 Hardy survivors of the first PWoLL, talking all things Cree over breakfast in Brandon Sunday, March 2nd. Thanks to Jeff Muehlbauer and Clare Cook, and Brandon University’s Native Studies Department for the warm welcome, and the opportunity to build truly nurturing connections across the prairies through yesterday’s workshop, the Cree chapter of which continues this morning over breakfast at Brandon’s Royal Oak. As we begin to disperse once again back across the prairies to continue our collective work on Cree, we’ll all be smiling warmly, despite the prairie wind chill. L-R: Arok Wolvengrey (FNU), Conor Snoek (UofA/CILLDI), Jan van Eijk (UofS), Antti Arppe (UofA/CILLDI), Arden Ogg (Cree Literacy Network), Jean Okimâsis (FNU), Dorothy Thunder (UofA/CILLDI).